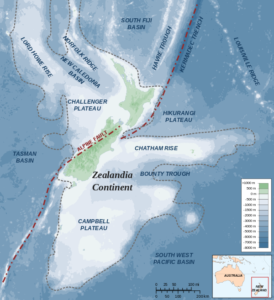 Zealandia, a landmass about two-thirds the size of Australia (of which 94% is under water), is a step closer to being recognized. A paper published in GSA Today, the journal of the Geological Society of America, contends that the vast, continuous expanse of continental crust, which centers on New Zealand, is distinct enough to constitute a separate continent. Will we see the introduction Zealandia in this century?